The Stormers achieved a rare bonus-point victory when they beat the Jaguares 35-8 at Newlands on Friday night. After a slow start, the hosts gradually started to dominate proceedings and now look a settled bunch. 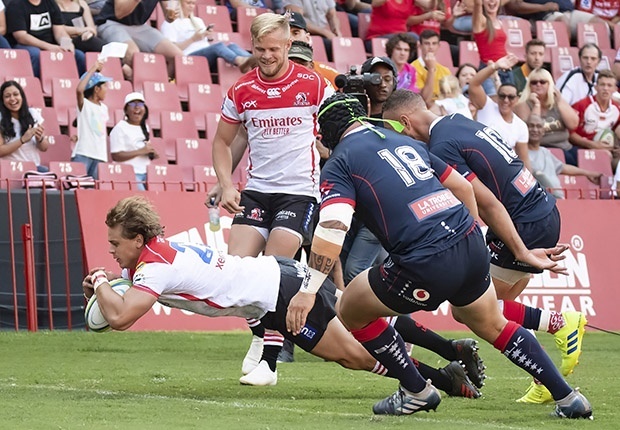 After losing 40-3 to the Bulls in Week 1, it would have taken a brave man to bet on the Stormers beating the Lions, Sharks and Jaguares in succession. In my view, the Stormers have one of the best packs in the competition and can feel confident ahead of a tough tour to Australasia where they will face the Hurricanes, Blues, Reds and Rebels. After trailing 33-5 early in the second half of their clash against the Melbourne Rebels, the Lions roared back to score 31 unanswered points for a 36-33 victory. The Lions bench made a significant impact, with replacement backs Lionel Mapoe and Andries Coetzee particularly impressive. The Lions can feel proud of their fightback but in the greater scheme of things they should be worried. The Rebels ran out of puff at high altitude and it's clear this Lions team is not yet at the standard of the one which made three consecutive Super Rugby finals. 3. NZ derby cancelled, name change for Crusaders? The Super Rugby clash between the Highlanders and the table-topping Crusaders was called off as a mark of respect for those killed in the deadly mosque attacks in Christchurch. Both teams received two competition points and the Crusaders on Sunday indicated that they may consider a name change in wake of the terror attacks. It's an emotional topic but I doubt people would have associated the Crusaders name in a negative light. As mentioned, Andries Coetzee was impressive coming off the bench to help the Lions haul in a big deficit at Ellis Park. Apart from scoring a try, the Springbok fullback completed 98m and beat seven defenders in an effort that may have caught the eye of national coach Rassie Erasmus. According to statistics derived from the competition's official website, Coetzee is currently joint-sixth in the most carries category with 48, fourth in the most metres carried category with 265m, and joint-fourth for most off-loads (7). Another Lions player making his mark is flank Marnus Schoeman, who scored his fifth try of the season on Saturday. Only Folau Fainga'a from the Brumbies has scored more with six tries this season. Schoeman is also ninth on the most carriers list with 45. Courtnall Skosan, who also crossed the whitewash against the Rebels, is joint-second in the clean breaks category with nine, trailing only Rosko Specman from the Bulls with 11. Stormers captain Siya Kolisi led from the front in their win over the Jaguares at Newlands. Apart from scoring a try, the Springbok skipper made 52 running metres, had one clean break, committed nine tackles and also won a turnover. Kolisi struggled for form in Super Rugby last year and it's vital for the Stormers and the Springboks that he performs in the southern hemisphere event. He said after the Jaguares game: "This was one of my better games. I feel I've been doing alright, I've been doing what's needed of me. This was a game where I had quite a few opportunities with ball in hand and I enjoyed it."